AIRS fully customisable risk matrix can be tailored to match an operator’s appetite for risk. AIRS incorporates a customisable risk matrix which can be tailored to match the operators appetite for risk. Another unique feature of AIRS risk management is the ability to record risk in more than one dimension for example, besides safety, you can record risk for reputation, financial, environmental or compliance. 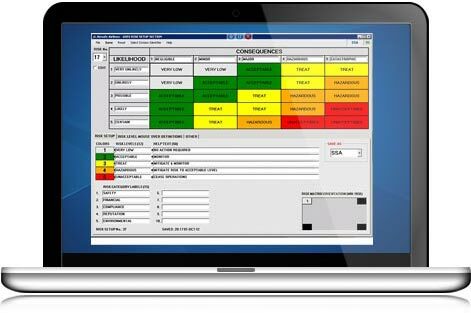 The AIRS risk matrix is used extensively throughout the application to record risk in both the occurrence and audit modules in addition to the dedicated hazard and risk registers. The Hazard Register is used to record and analyse identified hazards associated with activities, procedures and equipment. The captured information can be periodically reviewed as part of the continuous improvement cycle, and incorporated into employee education programs. The Risk Register is used as a proactive tool for creating safety cases in preparation for new operations or the introduction of new equipment or procedures. © 2019 Copyright International Safety Systems. All rights reserved.